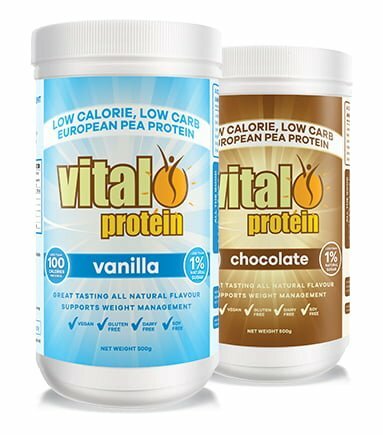 If you’re looking for a protein supplement to help your body function at its best, you can rely on Vital Protein Powder. 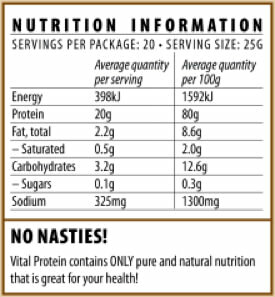 It contains over 18 amino acids, matching the profile of whey proteins which is unique for a vegetable protein. The protein is extracted from the highest quality European golden peas. This complete protein digests easily without causing bloating. Our vegan protein powder comes in three delicious flavours and an unflavoured option. A balanced source of protein provides the basic building blocks of many functions in the body. Protein is essential for healthy muscles, blood and organs, and our body needs it to create essential fatty acids, enzymes and hormones. Amino acids are used by the body for enzyme and hormone production, muscle repair & building, liver detoxification and immune cell production. Deficiencies in amino acids are linked to unstable blood sugar levels, low mood, water retention and fat storage. Our busy lives can make getting a balanced diet and adequate nutrition a challenge. Without all the nutrients we need, our energy levels diminish, mental acuity dips and we become vulnerable to illness and infection. One nutrient that is crucial to keeping the body strong is protein. A lack of protein may lead to fatigue, a weakened immune system, anaemia, low blood pressure, liver and kidney problems and a struggle to lose weight and a decrease in muscle mass. Vegans, vegetarians, those sensitive to dairy products, the elderly, immune-compromised and people who exercise a lot are particularly at risk of developing a protein deficiency, and should add a pea protein isolate supplement to their diets to make sure they’re getting enough of this life-giving nutrient. But beware, because not all protein supplements are created equal so you need to be aware of what you should be looking out for in order to get the best results. 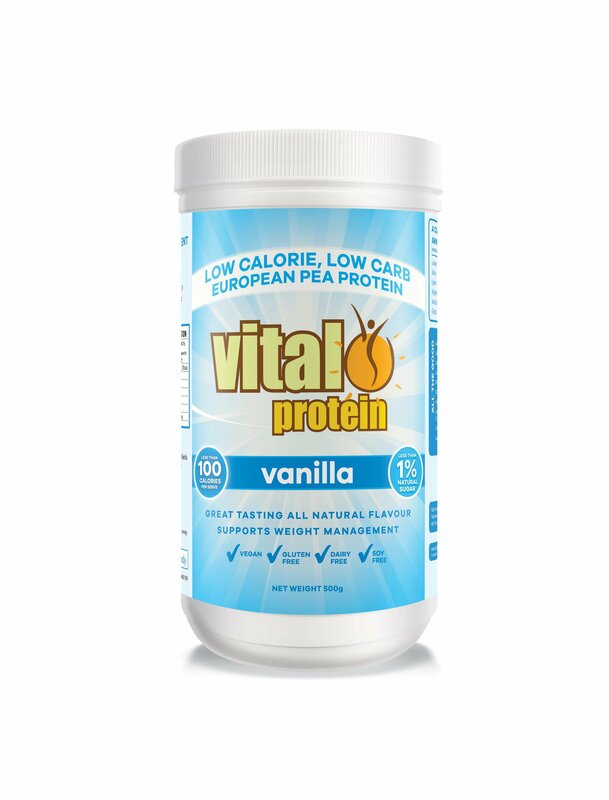 It’s a plant based, dairy free and lactose free protein powder, which means it is perfect for vegans. It’s easily digestible thanks to it being a plant based protein source. It helps the body to retain calcium and magnesium to protect your bones and muscles. With a pH of 7.8, it will help balance your body’s blood pH. It helps prevent the build-up of lactic acid, so it speeds up post-exercise recovery. It helps to control blood sugar levels, keeping cravings at bay. You’ll feel fuller for longer, helping to make weight control easier. It contains no artificial sweeteners, colours, flavours or preservatives. As Vital Protein Powder is completely natural, it’s the smart choice to achieve optimum nutrition without any negative effects on your body or major environmental impact. If you are allergic or sensitive to milk and dairy based products, there are few protein supplement options available that provide a complete amino acid profile that is highly digestible. pH base of 7.8 means that restoring you pH balance will help with detoxification, good digestion, and preserves calcium and magnesium in bones and muscles. It also inhibits build-up of lactic acid in muscles to help improve exercise recovery. Helps to maintain blood sugar levels throughout the day and supports optimal fat burning, making it a great choice for weight loss. Leads to feeling fuller for longer, which helps to control appetite. The most balanced and potent amino acid profile of any plant based protein, with 18 amino acids including all 9 essential amino acids. *Amino acid content may vary slightly from batch to batch, these figures serve as an example of an average analysis.